What are the content challenges faced by organizations and how can we create an effective strategy to solve them? It’s time to take a look at Intelligent Information Management. 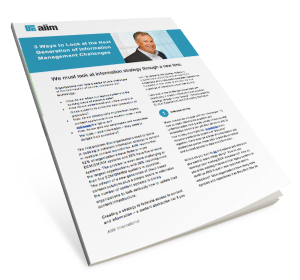 In this tip sheet, AIIM’s Chief Evangelist John Mancini shares his insights on looking at Information Management through a new lens. Submission of this form means you consent to receive electronic communications from Systemware.